I think you’ll agree that this is not an “average” vehicle ! 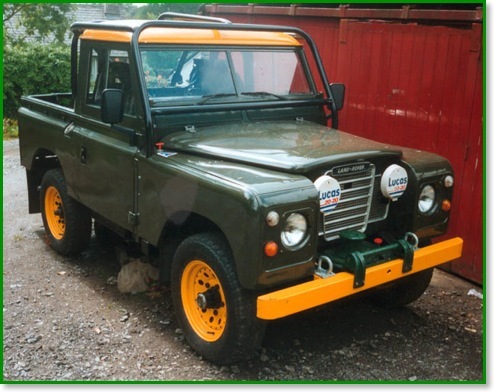 How many people would choose an old Series II/Series III (it is kind of a “bitsa” vehicle now, you know, bitsa this and bitsa that !) to go rallying with. Well that’s just what a friend of mine did - see his website here (the site is down at the moment). Apart from the rallying specific mods, this is yet another LPG conversion we did - this time a very basic one. With one eye on cost, and another on simplicity (not to mention reliability), we went for the most basic installation possible - a simple open loop setup with manual mixture valve. Not much to say really, except that after we converted it, it ran really well (we never did get the carb properly set up) - and we get some strange looks in the service areas with our hand pump and big red cylinders !